The reviewer borrowed a copy of the book from her local public library. 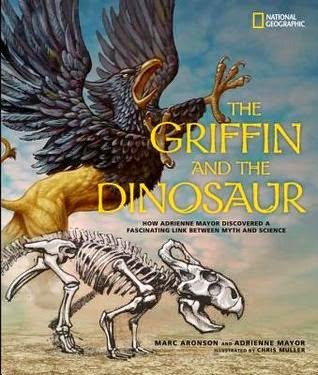 The Griffin and the Dinosaur is a nonfiction mystery that brings together mythology, history, science, and art. In a narrative style, Aronson chronicles Adrienne Mayor's quest to prove the link between the mythological griffin and fossils that ancient people may have unearthed. Over a ten year period, Mayor traveled to Greece numerous times, visited museums, interviewed archeologists, and pored over ancient texts. Mayor's perseverance paid off in 1986 while doing research at the Cornell Library. She came across photographs of protoceratops fossils while reading On the Trail of Ancient Man. The fossils found in the Gobi provided the evidence Mayor needed to link the protoceratops to griffin stories told by the ancient Scythians. While writing the book, Aronson spent time with Mayor at the American Museum of Natural History and interviewed her at her home in California. Muller's illustrations and the thoughtfully-placed photographs complement this intriguing story. A two-page map with detailed labels is located in the back of the book along with a glossary and list of related resources. The subject and length of the book (48 pages) will attract middle grade readers looking for a book to read an independently, and it would make an ideal classroom read aloud especially for students interested in mythology and ancient history.